Hand carved and cast sterling silver earrings adorned by 14k rose gold violets and 14k green gold leaves. 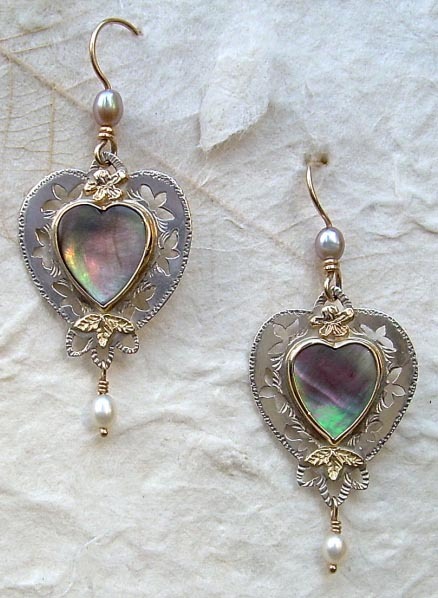 Freshwater pearl drops and 14k gold French ear wires finish the piece. 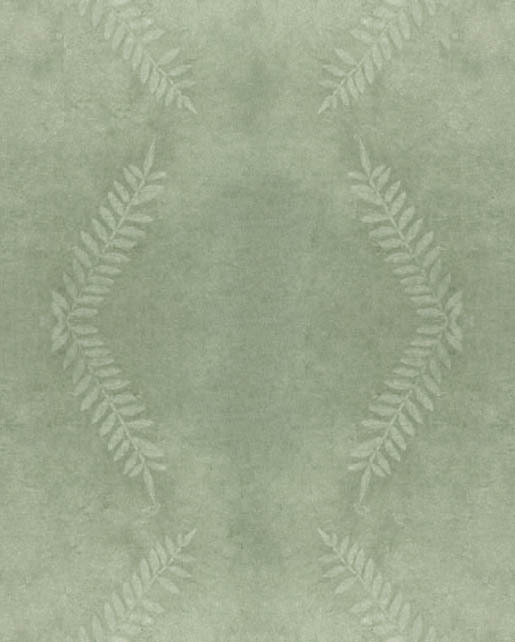 Measures 1.85" x .65". Matching necklace available. 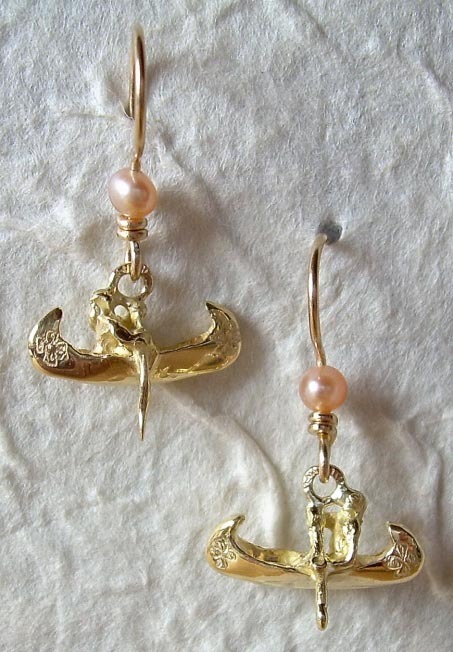 Hand carved and cast canoes with paddlers in 18k yellow gold dangle from the 14k French ear wires with freshwater pearls. Measures 1.25" x .75". The quiet coloring of Willow Creek Jasper hearts, set in 14k gold bezels, contrast the pierced and textured pattern of the sterling silver earrings. 14k gold flower and diamond shaped appliques are hand carved and cast. 14k gold posts and medium friction backs. Measures 1.25" x .65". Pierced and textured copper crosses hang from 14k gold ear wires. 22k gold bezel set precious topaz and a variety of colored freshwater pearls adorn the piece. Other faceted stones available - almandine garnet, blue topaz and peridot. Please e-mail. Measures 2.25" x 1.0". 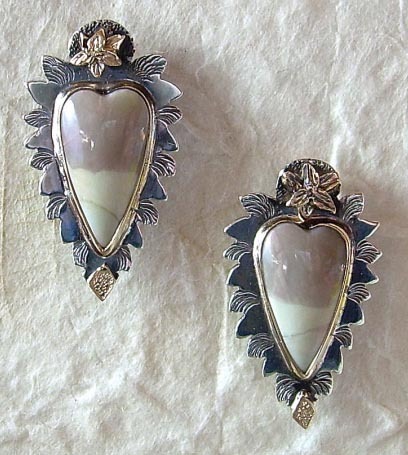 White mother-of-pearl hearts set in fine silver bezels are centered on the pierced and textured copper hearts. 14k yellow and green gold adorn the top and bottom of the heart. 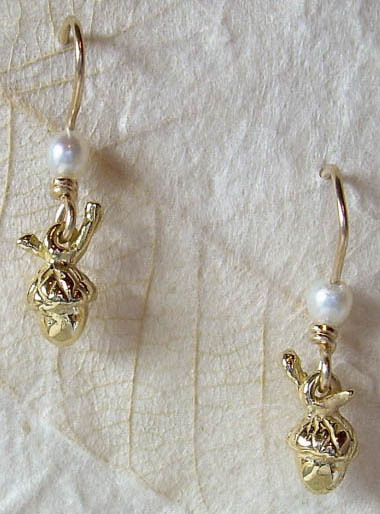 Freshwater pearls swing from the base and complement the 14k gold French ear wires. Measures 2.2" x .85". Matching necklace available. 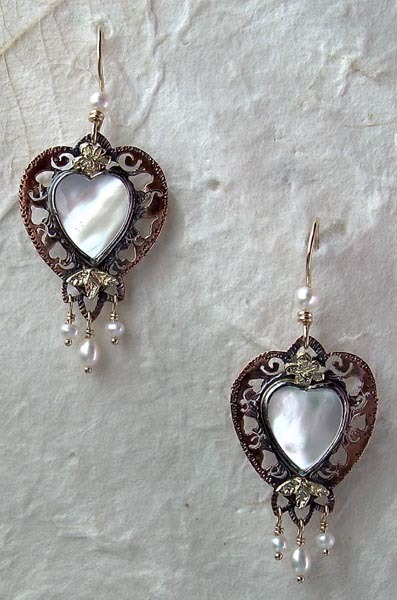 Natural black mother-of-pearl hearts set in 14k gold bezels are centered in the pierced and textured sterling silver hearts. 14k yellow and green gold violets adorn the top and bottom. 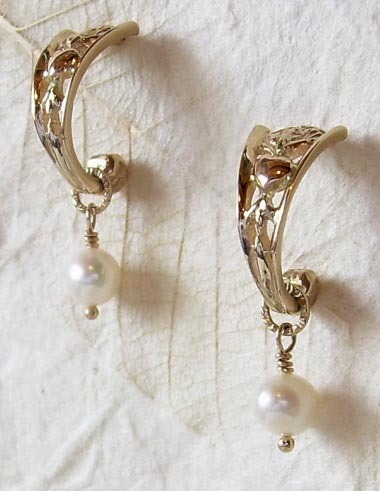 Freshwater pearls decorate the 14k gold French ear wires and swing from the base. Measures 2.2" x .85". Elegant yet versatile these hand carved and cast 18k yellow gold hoop earrings can be worn for many occasions. 14k rose gold hearts are soldered in the center. 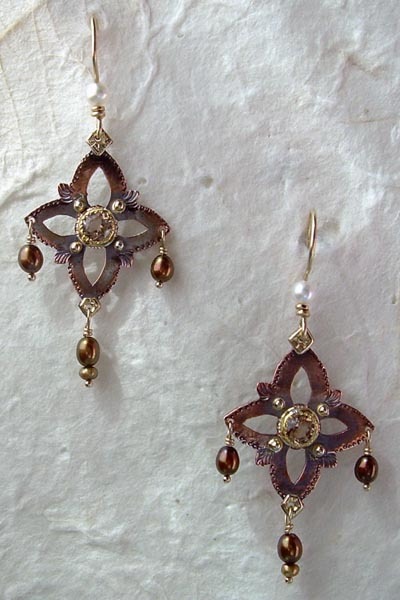 Freshwater pearl drops, 14k gold posts and medium friction backs. Measures 1.2" x .3". 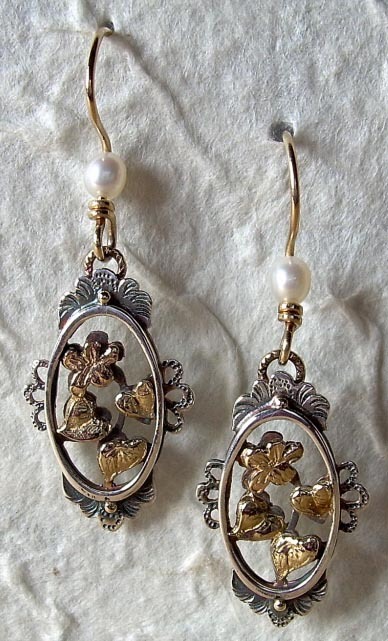 Hand carved and cast 18k yellow gold acorns dangle from the 14k French ear wires with freshwater pearls. Measures 1.2" x .25".